British bookseller Waterstones has somehow come into the possession of George R.R. 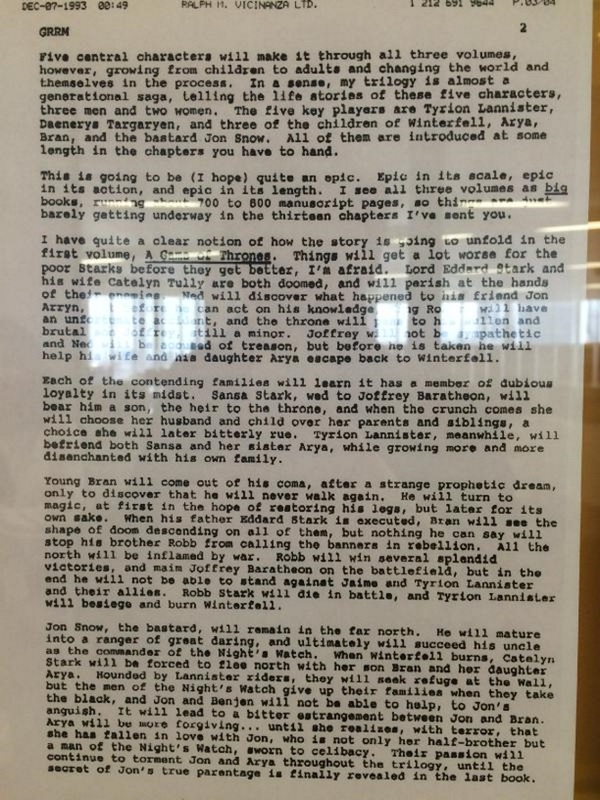 Martin’s original outline for Game of Thrones and the subsequent A Song of Ice and Fire series of fantasy novels, on which HBO’s Game of Thrones is based. Images of the outline, which was confirmed as authentic by Harper Collins UK, appeared on Waterstones’ Twitter, but have since been removed. Luckily, they survived in the initial report by WinterIsComing.net. If you’re interested, we've included the images in the gallery at the bottom of the page, but Comic Book have highlighted some of the most interesting parts for you. As this is such an early draft, there’s not much to worry about here as far as concrete spoilers go, but it does touch on some fan theory, so be warned. According to the outline, Sansa Stark was originally going to marry King Joffrey and betray her family, ultimately paying for her betrayal with her life. Martin seemed to be sticking to this plan in the first book of the series, but clearly changed his mind before pulling the trigger, setting Sansa on a different path instead. In perhaps the best decision Martin has ever made, he decided to scrap plans for a love triangle between Tyrion Lannister, Arya Stark, and Jon Snow. Because ick. The outline seems to clearly point to Jon Snow not actually being Eddard Stark’s son. More fuel for the R+L=J folks? Many of the series’ most antagonistic characters and houses are left out of the proposal. Instead, Jaime Lannister is depicted as a much less complicated, much more brutal and unsympathetic villain. Similarly, Drogo is much more of a villain in the initial proposal. This might explain why he seems so harsh in the books’ earliest pages, and softens over time. Also, Dany invades Westeros in book 2. BOOK 2! Game of Thrones will return to HBO for Season 5 on April 12.